Walking into the Hungarian Pastry Shop one day this past winter, Julius Genachowski ’85, chair­man of the Federal Communications Commis­sion, wonders if we’ll get a table. The line is long, with students and book bags pressed against the door. Genachowski makes his way to the counter and peers down at the cookies and cakes while I look for seats. Wi-Fi, I would quickly learn, has come to define Genachowski and the modern FCC. 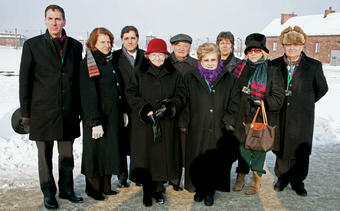 (Bottom) In January 2010 Genachowski (third from left) led the United States delegation to Poland for the commemoration of the 65th anniversary of the liberation of Auschwitz. His parents, Adele and Azriel, stand at far right. The chairman has come to the city from his Washington, D.C., home for Spectator’s Annual Awards Dinner, where he will be interviewed by Steven Waldman ’84, one of his senior advisers at the FCC (and his former editor-in-chief at Spec). The dinner is scheduled to take place later that night at the Columbia University Club of New York in midtown. But first Genachowski has agreed to a conversation and, as it turns out, a walk up Amsterdam in search of coffee and a table. Genachowski has for decades lived a particular admixture of technol­ogy, business, law and politics. In the early ’90s he earned a degree from Harvard Law School and clerked on the Supreme Court. He later was among the first to migrate from the high court to the FCC and, after two years as a staff attorney, jumped to the technol­ogy sector and made his fortune at the Internet media super-company IAC; he then launched a venture capital firm of his own in 2005. Now starting his fourth year at the helm of the FCC, he has taken an agency known for policing Janet Jackson’s wardrobe malfunction and morphed it into a platform for promoting universal high-speed Internet access. “You were completely right to send us that letter,” Steve Jobs told Genachowski, much to his surprise. Most countries have three or four agencies that do what the FCC does. One adopts policy for wired communications like telephone, another handles wireless communication and a third regulates satellite service. Then there’s the un­popular odd man who deals in content regulation — the censor. But thanks to Herbert Hoover, who as Secretary of Commerce in the 1920s fought to regulate radio, all these tasks fall to one agency in the United States. Much of the world, Genachowski says, thinks the U.S. is at a competitive advantage for having all communication policy under one roof. 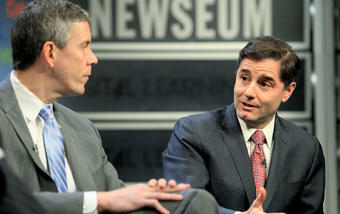 Not long after President Barack Obama ’83 ap­pointed Genachowski chair of the FCC in 2009, Jobs asked for a meeting. At the time, the iPhone and AT&T were in the news because it had become apparent that the video chat platform Skype was blocked from use on what was fast becoming the world’s favorite smartphone (an AT&T demand, it was later learned, that kept people chatting on plan minutes rather than on free Internet services). The FCC said it would look into the fairness of what many talking heads said was an anticompeti­tive practice, and Genachowski sent Apple a letter saying so. 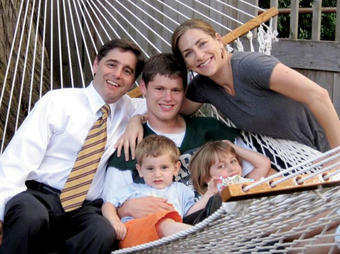 “We met in San Francisco in a small conference room,” Genachowski recalls. Jobs’ reputation pre­ceded him, so Genachowski steeled himself for a berating. The room was spare. The Apple founder walked in alone. “You were completely right to send us that let­ter,” Jobs said to Genachowski’s surprise. “It’s a problem. We’ll fix it. Let’s talk about something else.” The conversation ranged from mobile in­novation to digital textbooks, to Wi-Fi and spec­trum, which refers to the airwaves that wireless transmissions travel on. Genachowski has found the last is probably the technology sector’s favorite topic of conversation. 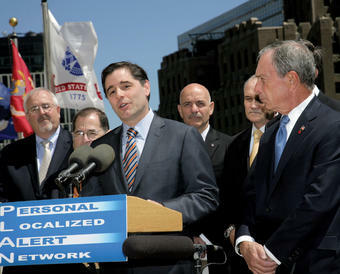 With Manhattan as a backdrop, Genachowski in May 2011 announced a new public safety system that sends geographically targeted alerts to enabled mobile devices. NYPD Commissioner Raymond Kelly and NYC Mayor Michael Bloomberg stand at far right. PHOTO: FCCWhen he moved into Carman Hall as a fresh­man, spectrum carried radio and local television but not much more. The technology he plied was typesetting — a craft he honed at Spectator and translated into income with a $13-an-hour job set­ting type at a print shop on Broadway. That night at the awards dinner, Genachowski would recall his days of typesetting and X-Acto knives with Waldman, a co-founder of Beliefnet.com who also is a visiting senior media policy scholar at the Journalism School. Genachowski was editor of Spec’s Broadway magazine. Genachowski was on the pre-med track before switching to history in 1982. He joined the Co­lumbia University Emergency Medical Service, then made side money as a CPR instructor. He edited the Columbia Guide to New York, which was distributed to bookshops throughout the city. And, after some time at Spec, he set up to compete against it by reestablishing Columbia’s oldest newspaper, Acta Columbiana, which was founded in 1868 but had been on a 100-year hiatus until Genachowski came along. 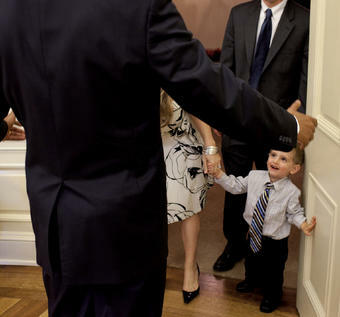 Genachowski’s son Aaron met President Barack Obama ’83 in August 2009. PHOTO: COURTESY THE WHITE HOUSE“When I was in college, I wouldn’t have guessed how this would have tied together, but — it’s inter­esting in retrospect — what Columbia provided for me was the opportunity to be entrepreneurial: to start a newspaper, to run the guide to New York, to teach CPR. It was an invaluable time in my life,” he says. With his interest in the media well stoked, Genachowski applied in his junior year to be a re­search assistant for Fred Friendly, Edward R. Mur­row’s producer, legendary newsman and eventual president of CBS News, who was teaching at the Journalism School. Genachowski was selected as the only undergraduate in a small army of J-School students. Their research became the basis of Friendly’s popular book and PBS series, The Consti­tution: That Delicate Balance. McCorvey would go on to appear in The Consti­tution and became a lifelong friend of Friendly’s. “I count that experience and having Fred Friendly as a mentor as deeply inspirational to me on the im­portance of free speech and the First Amendment,” he says. We have found our way to Kitchenette and a table near the door. The waiter asks if we need a drink. “That would be interesting, wouldn’t it?” Gena­chowski says with a laugh. He is due on stage for Spec in a few hours. He orders a decaf cappuccino. Genachowski seemingly grows younger with age. Photos from his days at Columbia and Har­vard Law show a wooly beard creeping high on his cheeks, rumpled clothes and what looks like a slouch. All these years later, clean shaven, wrinkle-free — in face and dress — his appearance matches the boyish enthusiasm he shows for his work. Wi-Fi and unlicensed spectrum like it is a great success of the FCC. In the mid-’90s, the FCC auc­tioned the rights to these airwaves on the free mar­ket. Some were licensed bands — proprietary fre­quencies — and became the wireless networks for the likes of AT&T and Verizon. Others remained unlicensed and open to all, allowing innovators to develop technology for the space. Enter Wi-Fi. For many, Genachowski points out, Wi-Fi pro­vides the only public connection to high-speed Internet. In speeches and public events, he often mentions a letter the FCC received from a Florida high school student. (He notes that, while he had never believed it, government agencies actually do receive letters from constituents.) The Florida stu­dent wanted the FCC to know that in order to do her homework, she had to go to the local public library after hours, sit in the parking lot and con­nect to the library’s Wi-Fi. In March 2010 Genachowski unveiled the Na­tional Broadband Plan, with the stated goal of connecting 100 million American homes to high-speed Internet within 10 years. He worked with cable and telecommunication companies to de­velop a national broadband rate for low-income families. Any home with children in free lunch programs can qualify for $9.95 a month high-speed access, a savings of 75 percent or more in some areas. Equally significant, Genachowski’s FCC revamped the moldy Universal Service Fund in order to pay for this access. Started during the Great Depression as part of the Communications Act of 1934 — then re­vamped and renamed in the Telecommunications Act of 1996 — the Universal Service Fund is es­sentially an enormous pool of money, collected in cents through a charge on our phone bills, used to extend telephone service into rural communities. In 2011 Genachowski convinced Congress that it was time to switch emphasis. The Depression-era goal of telephone service for all areas had been ac­complished; now was the time to connect the na­tion via broadband. Congress agreed. Genachowski’s dedication to promoting uni­versal high-speed Internet access has been no­ticed, and has set him apart from his predecessors at the FCC. I’ve asked Genachowski a couple different ways, with varying degrees of tact, about his friendship with Obama. They got to know each other during their days on the Harvard Law Review, and he manages to answer without saying anything particularly revealing about the First Family. They are good friends, he says, add­ing that they attended each other’s weddings, but beyond that, they deserve privacy, like any other American family. “How about poker at the White House? Tell me about that,” I joke. He does confirm, however, that at the Law Re­view, poker games and basketball were routine. Genachowski has played basketball since child­hood in Great Neck, N.Y., and his 21-year-old son, Jake, who attends Kenyon, has proven athletic as well. (His other children are Lilah, 7, and Aar­on, 5.) When Jake was in high school — and even now, on college breaks — he joined his father for a regular Sunday morning game at Sidwell Friends School in Washington, D.C. ESPN The Magazine has written it up, noting Jake’s excellence, at least on the court with 40- and 50-year-old Washing­ton ballers. The game includes regulars such as Federal Trade Commission chairman Jon Leibow­itz; Hans Binnendijk, the No. 2 man at National Defense University; Yochi Dreazen, a reporter for National Journal; Tom Freedman, who was a senior adviser to President Clinton; and former Secretary of the Navy Richard Danzig. As a fundraiser and technology adviser during Obama’s presidential run, Genachowski was the guy in the room preaching social media. “We’ve all played together for a very long time, like 20 years,” Genachowski says. Obama, Genachowski says, has not attended that game, but his right-hand man, David Axel­rod, has. The President’s interest in and fluency on technology issues, however, is as impressive as his reported ballhandling. As a fundraiser and technology adviser dur­ing Obama’s presidential run, Genachowski was the guy in the room preaching social media. The President, he says, “instantly got it.” Those early conversations about the power of apps, Facebook, Twitter and YouTube were foundational to the grassroots campaign that tipped a close Demo­cratic primary in Obama’s favor, and ultimately the election. Genachowski’s father’s experience as an im­migrant in America who earned an engineering degree at M.I.T. is the first thing Genachowski mentions when asked about his influences. He explains how, as a 5-year-old, Azriel Genachowski was whisked from Belgium with his parents after the Nazis occupied the country and began round­ing up area Jews. What is known about the fam­ily members who stayed behind is due to meticu­lous Nazi record-keeping: they were driven to a cattle car, shipped via train to Auschwitz-Birkenau and “gazés à l’arrivée” — gassed on arrival. When Obama asked Genachowski to head the U.S. del­egation commemorating the 65th anniversary of the liberation of Auschwitz, in January 2010, Gena­chowski said in his speech that the family he lost in the death camps has lived on in eight grandchil­dren, 21 great-grandchildren and 45 great-great-grandchildren. 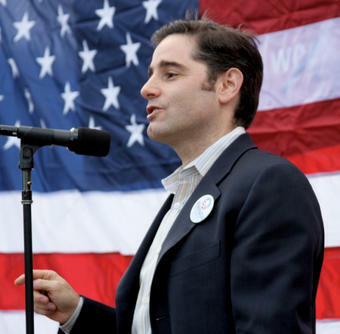 Genachowski spoke at a rally for Obama during the presidential campaign in August 2008. In 1985, Genachowski moved to D.C. and into a Dupont Circle apartment with Waldman. The future FCC chairman soon distinguished himself on the staff of then House Rep. Charles Schumer (D-N.Y.) and worked for the House Select Committee on Iran-Contra. He attended Harvard Law from 1988–91, afterward returning to D.C. to clerk for Abner J. Mikva, then-Chief Judge of the Court of Appeals for the D.C. Circuit. As Mikva tells the story, he first offered the po­sition to Obama, whose credentials as president of the Law Review made him an ideal candidate. “But Obama,” according to the judge, “said no. He wanted to go back to Chicago and run for public office.” Mikva’s connection at Harvard then said something like, “Well, there’s this other guy …” and Genachowski, when offered the opportunity, immediately said yes. “He was one of the best clerks I’ve ever had,” Mikva says, “and I was on the bench for 15 years and saw more than 500 cases. He’s a very enthu­siastic person.” Genachowski later clerked for Supreme Court Justices William Brennan and David Souter. Among the cases he worked on was the first “must carry” decision, which re­quired cable companies to carry locally licensed stations. In 1994, Genachowski made the move from Supreme Court clerk to FCC staff attorney. It was an unheard-of migration back then, but has since become routine for attorneys interested in tech policy. During this time in his life, Genachowski says he first glimpsed the new, connected Amer­ica in the basement of the engineering library at Georgetown. Two rudimentary servers were set up and FTP files could be transferred between them. 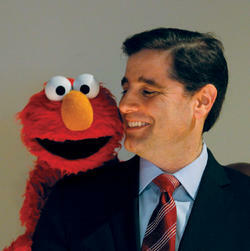 Genachowski leapt into the private sector in 1997. Soon he became chief counsel, and then COO, for Barry Diller’s IAC. It’s where Genachowski says he learned the lessons of management. Genachowski’s decaf cappuccino has gone untouched. In an hour he’s due at the Columbia University Club. I ask him one last question, a question he’ll be asked on stage later that evening and one he is asked, I imagine, everywhere he goes. Technology-wise, what will the future look like in five years? In 10 years? “One of the wonderful things about innova­tion is you can predict some things, but the cool­est things you can’t,” he says. “Five years ago, who could have predicted Twitter? Who could have predicted the success of Facebook, or the way we’re using Amazon? A lot of things we’ll be talking about in five years haven’t been in­vented yet. Michael R. Shea ’10 Arts is a freelance writer based in New York.